Mickey 6's Story . . .
Update 7/2/2013: "Despite being diagnosed with advancing renal failure, his temperament was gold and his will was iron." Mickey came to MAESSR in April. His family felt blessed with the opportunity to foster this special senior, and, shortly, he became “Ben” to all who met him. His background was really not known, but all the signs indicated he had suffered from neglect and abuse for quite some time. Despite his hard luck, Ben was a kind and gentle soul. Despite being diagnosed with advancing renal failure, his temperament was gold and his will was iron. He became a permanent foster and, in the process, placed a permanent stamp within his foster mom’s heart. Through every day of care, his eyes conveyed such a depth of gratitude………..and how he enjoyed having a home that included a goofy brother and sister. Ben crossed to the Bridge this week with his foster mom holding him and wishing him a pain-free journey. Her parting hope was that she gave Ben as much joy as he brought to her life in their short time together. His family will never forget Ben. And, as surely as he has joined others of the MAESSR family at the Bridge, he will be hoping to cross paths with them again some day. Godspeed, Ben, and peace to his foster family for giving your all and your best…………..
Update 05/19/2013: "Then it’s “Daytona Beach” on the upper deck, where he stretches out on beach towels with the two residents to soak up sun." Mickey, answering to Ben these days, is feeling so good. Two days after his stitches came out, he was permitted to start navigating steps. He took immediately to the stairs, climbing up and down all of the staircases without a hitch. He has enjoyed going down to the family room every evening for TV, treats, and lounge time. He has enthusiastically journeyed up two flights of stairs for bed and bath, and out onto an upper deck and down a long flight to the backyard. It’s not just the stitches coming out, of course. It’s the increased activity he’s enjoying daily as well as the supplement beginning to yield a benefit! Ben loves to walk the yard while the resident Springers play ball. Then it’s “Daytona Beach” on the upper deck, where he stretches out on beach towels with the two residents to soak up sun. His fur is growing in thick and shiny. During his recent bath, Ben jumped out of the tub three times, demonstrating how well he can shake water all over the bathroom! Now that he has been completely incorporated into the pack, he has gained confidence and is not as anxious during the day when his foster mom leaves the house. Ben’s appetite has increased, so continuing to gain much needed weight is easier. He has not had to consume as much water, so his need for frequent potty trips has decreased. There have not been any daytime or nighttime accidents for days…………yeah, Ben!! Nor is he “leaking” while sleeping or standing. His medication is working. He sleeps peacefully for six hours through nights now, only waking up because the resident Springers rise at 4 AM for their first trip out and breakfast. He seems to only have an accident now when he's left alone, never when he's around the other dogs and/or his people. He's so content being with the three of them. With continuing good nutrition, his vision has improved too. His eyes have become clear, losing the foggy appearance they had when he was taken into the shelter. Ben is noticing everything within the house and outside now. While out, he loves to visit all the neighbors. This includes Olivia, the cat across the street, with whom he is fast friends. Ben’s overall mobility is so much improved. He has had three long outings each day for days now and is demanding more walk time. He’s climbing small hills and inclines to strengthen his legs and does really well. There's such a big difference in this boy since the evening he departed the shelter. He could hardly stand and walk that night. Now, he's forging ahead on walks to sniff and check things out. He actually pulls his foster mom if he's adamant about tracking something! She’s been excited about that and about the greetings Ben can give now when she comes home; Ben can jump to give her kisses…………absolutely OK and precious coming from this dog!! Original: "This very social boy enjoys the whole meet-and-greet process." 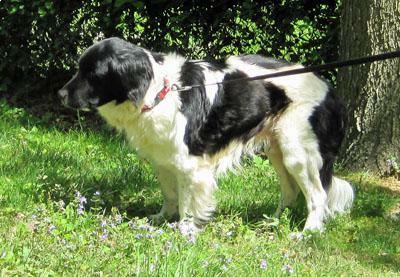 When a Pennsylvania shelter took in a stray senior Springer that was suffering from extreme starvation and dehydration, the staff contacted MAESSR for help. 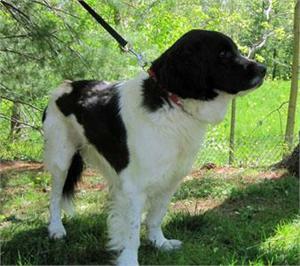 Poor Mickey could barely navigate when he was brought to the shelter. He must have had a very hard life as a stray for some time. Due to a bad flea/tick infestation, his skin was inflamed from a combination bacterial and yeast infections; it was also dry due to lack of nutrition. The shelter staff quickly tended to Mickey’s basic health needs; he was brought up to date on vaccinations, neutered, had fleas and ticks removed, and had infected molars removed. Becoming a MAESSR boy has ensured the continuation of good medical care for Mickey and a loving home during his final days. In foster care, Ben has demonstrated an incredible will to survive and be happy. Due to his emaciated state, his foster parents have been feeding him multiple small meals each day to help him gain weight. His thin cataracts do not stop him from seeing his people or surroundings. He visually tracks rabbits at night and birds by day. To help alleviate some age-related bladder issues, the vet put him on medication that has worked very well although he must urinate frequently. Mickey is deaf to normal volume and pitch, but hears loud and unusual noise. There is a degree of age-related arthritis in his back, hips, and legs for which he could benefit from joint supplements. However, this arthritis does not deter Mickey from going on walks or using stairs; he thrives on walking. His skin condition is a work in progress. Now that his neuter stitches have been removed, Mickey has begun receiving medicated baths for his skin. The vet is monitoring Mickey’s blood work which showed him to be anemic and to have possible kidney-related issues. This onset of renal problems is Mickey’s primary health concern. He needs to urinate frequently, particularly after meals. During a typical day and night, his maximum hold time is approximately 3 hours. This issue makes Mickey a special needs Springer. The ideal home for Mickey is one that can provide supervised potty trips on an around-the-clock basis. Mickey was given his name by the shelter staff, but his foster family found he responds much better to their pet name for him – Ben. His foster folks were pleased to find that he is housetrained and will bark when he needs to go out. If they do not respond after four soft woofs, he will transition to a soft double woof until they comply. Although he is good with being crated, Mickey does well having free run of the house when his foster family is home. When they are out during the work day, he is kept in the kitchen and family room— areas with washable floors in case of any accidents. Mickey is very content finding a comfortable place to rest such as a fluffy comforter or a comfortable dog bed. He has done very well with two to three visits from the dog walker during the long work day. Mickey has excellent house manners with no destructive behavior of any form and due to age he does not exert himself in any way with counter-surfing or jumping on furniture. Going for walks is one of Mickey’s favorite activities. 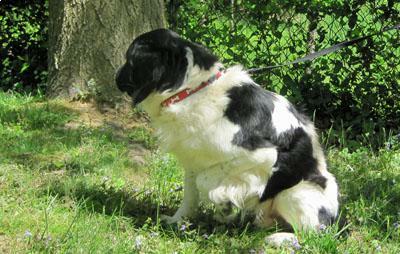 He enjoys sniffing, checking out the neighborhood, greeting people, and meeting other dogs. This very social boy enjoys the whole meet-and-greet process. He gives a cheery bark and wag of tail whenever he sees someone he knows and everyone enjoys meeting him! This boy is excellent on leash and will indicate where he wants to go, but does not charge or pull. Mickey wants to be included on all trips but does not have much experience riding in a car. It is best that he rides harnessed or in a crate; otherwise, he tries to ride on the console for the bird’s-eye view! Mickey doesn’t seem to know what to do with toys, but likes to keep one or two close to his blanket. Because Mickey is hard of hearing, he does not respond to verbal commands he is given. Very quickly, he has learned the hand signal for “come” and “stay,” and is in the process of learning other handy signs. Mickey so wants to be with a human and be part of a household that he is eager to please and fit in. He will do whatever is indicated if given the chance to learn. Mickey has not been taken to a groomer as yet. At home he has been fine with getting a dry bath and having his ears handled. This sweet senior Springer shows no resource guarding issues; he will share everything and allows his foster family to handle his food while he is eating. Without an aggressive bone in his body, Mickey is one kind and gentle soul. Thrown away as a senior, his only fault – aging, Mickey is grateful to have a second chance to live and find a family. He is still in the process of gaining weight and needs to be fed several times per day. Good nutrition is repairing Mickey’s health, strength, skin, and fur. He is once again a good-looking chap. With pieces of chicken breast, liverwurst, and hotdogs enhancing his food, Mickey’s appetite is being refined! Yum! A medication/pill savvy pooch, Mickey can smell a pill a room away and can sniff it out even if disguised with lumps of food or pill pockets. Pills must be completely wrapped three times over with liverwurst. Once that gets in his mouth, it immediately is followed up with another slice of liverwurst! As much as giving Mickey his meds takes some creativity and fast moving, giving him his medicated baths is a breeze! He was excellent when given his first medicated wet bath at the vet’s office post removal of stitches. A true Springer, Mickey enjoyed the water as well of the attention and massage! Due to his frequent need to urinate, Mickey must be placed into a home that has human supervision for as much of the day as possible. Potential owners who work from home or are retired would be the ideal situation for Mickey. He will make an excellent companion as he is most happy at someone’s side 24/7. Mickey will welcome his human every day with a terrific little jump and tap dance, and will be so happy to receive a hug in return! With MAESSR’s help, Mickey will find a family that will open their hearts to him and provide him with a warm and loving home in the twilight of his life. He has waited a long time to feel a soft hand and kindness. To Mickey, the wait will be worth the love he receives. If his life just spans months rather than years, Mickey will be loved.